For Pharmacy Benefits, Is Greater Choice Always Better? In health care, Americans demand choice. Insurers must strike a balance between respecting that demand and encouraging their members to opt for the most cost-effective care. That challenge is especially tough when designing pharmacy benefits — heavy direct-to-consumer advertising is driving up demand, and costs are rising at unsustainable rates. 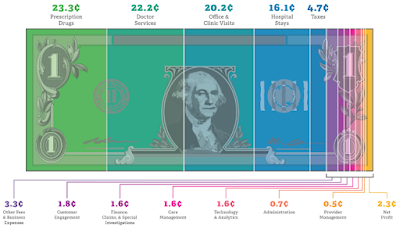 Nearly all payers use tiered drug formularies to move patients toward the most cost-effective drugs while still offering broad choice to people who are willing to pay. A growing body of research shows that pharmacy-benefit design influences whether patients with chronic medical conditions start and adhere to their essential medication regimens — which, of course, affects the long-term value of those prescriptions. The bottom line for benefits managers and payers: Not all pharmacy-benefit choices are created equal. Patients have strong preferences about how they get their medications. When enrolled in a pharmacy benefit that offered a 90-day supply of prescriptions via mail service or a retail pharmacy (with no difference in out-of-pocket costs), each mode of access was selected by about half of patients in a large retrospective study. And evidence shows that giving patients such flexibility improves their rates of adherence to essential therapies. In one study, comparing patients in a mandatory mail-order plan with patients who could choose to fill their prescriptions at either mail or retail pharmacies (with the same copay), the 90-day adherence rate was 30% better for the patients who had a choice. Results are similar specifically for adherence to specialty medications: Patients who could choose between a specialty mail-order pharmacy and a retail pharmacy, rather than being limited only to the mail-order option, had a 17.5% higher rate of filling a second prescription and an 11.4% higher rate of overall adherence. Should Patients Choose the Medication, Too? expensive, both for the payer and for their own wallets, without a clear clinical rationale. In tiered benefit plans, which charge higher copays for name-brand medications, prescribing those medications leads to higher costs and poorer health. For instance, prescriptions for name-brand drugs are three to four times more likely to be abandoned right at the pharmacy when patients experience “sticker shock” and then leave without the drug in hand. 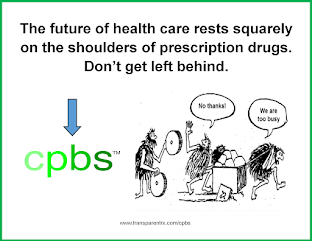 And if patients or physicians request that a branded medication be “dispensed as written,” with no option to substitute a generic, patients are 37% more likely to fail to fill the initial script, and more than twice as likely not to fill subsequent prescriptions. In addition, patients with chronic conditions (e.g., hypertension, diabetes, hypercholesterolemia) had significantly higher adherence rates to generic drugs than to nonpreferred brand-name drugs (59% vs. 52%). Among patients with heart disease, choosing a generic led to better adherence and fewer adverse clinical outcomes. 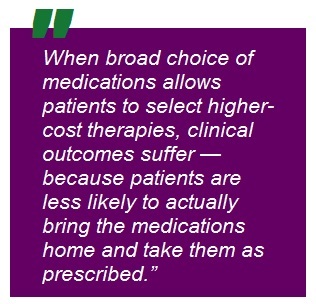 In short, when broad choice of medications allows patients to select higher-cost therapies, clinical outcomes suffer — because patients are less likely to actually bring the medications home and take them as prescribed.